Shopping for a mattress can be overwhelming. Learning about your options beforehand can ensure you find the most comfortable mattress to suit your needs. Remember you can also buy a mattress online – this company offers pocket sprung mattresses delivered to your door, eliminating the need to search for a new bed. We spend more than a third of our lives sleeping. Why, then, do so many people shop by price when it comes to buying a mattress? While, of course, consumers should consider their budgets, if a mattress is not comfortable, quality of life may suffer. Here is some necessary information to help consumers find the most comfortable mattress. Mattresses fall into three general comfort categories: firm, plush and pillow top. Infinite variations exist within the categories, but they usually fall into one of the three. The comfort category does not affect the support the mattress provides. A common myth is that the firmer the mattress, the better the support, but support is determined by the mattress construction and its foundation, not the cushioning, or lack thereof. Firm mattresses, as their name suggests, are the hardest. Pillow tops are the opposite end of the scale, being the softest, with, as their name implies, a pillow cushion attached to the mattress. Plush mattresses fall in between. The “guts” of a mattress will determine not only how hard or soft it is, but also how a body reacts to it. Most mattresses can be divided into the following categories: spring mattresses, latex mattresses, and memory foam mattresses. Within each category, you will find firm, plush and pillow top mattresses so you can find the best fit for your individual needs. Spring mattresses are the traditional mattresses most people think of. They are made by joining a series of metal springs to form a rectangular base, then covering those springs with foam and cotton padding, then a fabric cover. The amounts of foam and cotton are what determine the comfort level. Latex mattresses are typically made from either natural or synthetic latex rubber. They are constructed by applying a thick layer of latex over a layer of high-density foam. Over the latex may be additional foam or padding to adjust the comfort level. Memory foam is a type of foam that conforms to the body. Though the material is a bit different than the “generic” memory foams, Tempur-pedic mattresses could fit in this category. Frequently high-density support foam lies beneath the memory foam, and additional padding on top of the memory foam may be added for comfort. 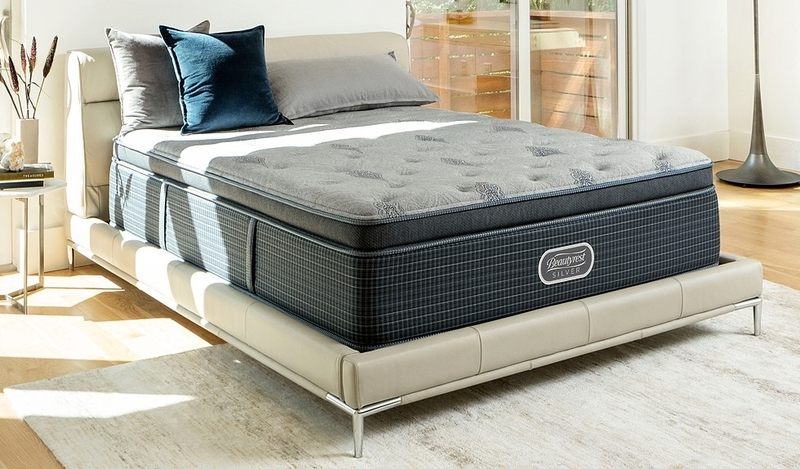 Important to note is that with latex mattresses, the body rests on top of the mattress, while with memory foam mattresses, the body sinks into the mattress. Sleep Number beds are in a category of their own and rely on air pressure to create adjustable support and comfort levels. All mattresses, regardless of construction or comfort category, require a foundation, usually referred to as a box spring. These foundations provide a base for the mattress while also allowing a little give for proper support. Box springs now come in two heights, the traditional nine inches and a low profile five and a quarter inches. The support is the same. The only difference is aesthetic (or practical, if height is a concern). Box springs for full- through king-size mattresses are also available in splits, meaning they are two-piece box springs instead of one. Again, support is the same. The only difference? Splits are easier to get into and out of a room, if space is an issue. Platform beds are the exception to the rule; they do not usually require a box spring. With children, if height is a concern, an alternative to a box spring, known as a bunkie board, can be used instead. It is often thought that the length of a warranty will determine how long a mattress will last, but this is a common misconception. Warranties are protection against manufacturer defects. They do not determine how long a mattress will be comfortable. A cheap mattress, regardless of warranty, is still a cheap mattress, and it will most likely lose its comfort in a relatively short period of time. Though not always the case, a higher quality, and thus pricier, mattress will tend to stay comfortable longer. Mattress shopping is very subjective. The best way to determine the right mattress is to try as many as possible. Don’t just push on them. Don’t just sit on them. Lie down on them. It’s the only way to determine if a mattress will be comfortable. Spend as much time on them as possible. Try other mattresses, then revisit favourites. The options are endless, but taking the time to find the right mattress for you will ensure you get a good night’s sleep for years to come.